I started a book once. I’m sure it was a great book. The problem was I couldn’t get past the first few pages. It was the age-old problem. There was too much information. My interest waned as the author described each person, place, and object in minute detail. Maybe it was impatience on my part, but I wanted to get to the meat of the story. Details are vital to any story. I won’t deny that. What we must do, is learn to discern between significant and insignificant details. Significant details make a story come to life. … Insignificant details? They bore the reader. Imagine this scene: A man, gun in hand, is chasing a woman through a garden. Do we really need a description of each tree, flower, and weed in the garden? Do we need a detailed description from head to toe of the woman as she runs? Of the man as he chases her? I think not. They’re not necessarily significant. Some details are fluff. Some are absolutely necessary. The setting, now that can be vital. Is this scenario unfolding at midnight in an abandoned garden miles from the nearest town? Or is it in the garden of a posh estate where guests are scattering left and right to clear a path for her as she runs from her pursuer? Such details are significant. More importantly, we want to know why she’s running. We want to know what she is feeling. We want to know why the man with the gun is chasing her. We want to feel emotionally connected to the characters. We want the plot. These details are significant. Of course, a different story line introduces a different set of significant details. A young woman meandering through a garden, reminiscing of moments spent there with her beloved fiancé who has gone off to war—now I could see her stopping to admire the flowers. She might nostalgically pick a rose, one like her fiancé had given her in the past. As she brushes it close to her face, its fragrance brings back sweet memories. In this scenario the flowers are significant. Significant or insignificant? What type of details are we writing into our letters, articles, or novels? Are we taking the time to go back and delete the insignificant? Any thoughts to share? Please feel free to write in the comment box. I confirmed that I DO have the legal right to turn my first book, BETRAYED, into an eBook. Now the work begins! The manuscript needs to be edited and formatted, a new cover will need to be designed, and then it will need to be uploaded to the Kindle store. I’ll keep you posted of the progress. Sometimes rules are made to be broken. Even grammar rules. I’m a rule-follower by nature—and a compulsive reader on top of that. Combine those two traits and you have someone that knows rules that a good portion of the population don’t know exist and religiously follows them. Well, maybe not quite that bad. But you get my point. I don’t intentionally break rules. But sometimes we must. We need to know when NOT to follow the rules. As much as I love grammar, as much as I love studying the structure and intricacies in language, I know there are times when grammatical rules must be forsaken or I will fail as a writer. There are times when self-expression trumps the revered style guides. 1. Don’t start a sentence with a conjunction, such as AND or BUT. But what about when you’re trying to make a statement? Right. You get it now. Point taken. Sometimes it is necessary to begin a sentence with a conjunction to make a point. It adds emphasis. 2. Never use sentence fragments. Talk about shoving self-expression into a box and throwing it into a deep pit. A dark pit. A pit filled with grammar rules etched into its walls. A dark pit that insists each sentence fragment be rewritten as a complete sentence. We must rescue sentence fragments from the pit. Sentence fragments add emphasis and zing. They don’t dwell on what they’re getting at. They just say it. Short and snappy. Self-expression at its best. 3. A paragraph must be between three and five sentences long. We live in a fast-paced society. We scan multiple articles on the worldwide web on a daily basis. We even read posts on our smartphones. We’re in a rush. Has this affected the desired paragraph length? Maybe, maybe not. Literary style, as with other styles, changes with time. Whatever the reason, particularly in articles and posts, short paragraphs reign. They pull us along rather than bogging us down. They get to the point. Longer paragraphs aren’t all bad. In writing fiction, I prefer a blend of shorter and longer paragraphs to keep staleness at bay. And then there are those one sentence—or one word—paragraphs. A rebellious blend of sentence fragment and too short of paragraph. But they make their point. Wonderfully. By no means is this an exhaustive list. This is just to get your creative juices flowing, to get your mind considering that literary license may permit you to break the rules. At least some of them. Our goal is to communicate. If the rules get in the way of communication, put them on the shelf. Learn the rules. Learn how to use them. And learn when its time for self-expression to trump the rules. Are you ready to break the rules? Do you have any examples of your own to share? Please do so in the comments section. 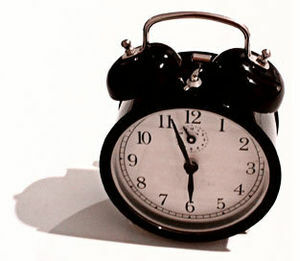 …making this nearly six o’clock alarm to the left look very appealing! The coffee is on. A mug sits steaming beside me, the steam peeking up over the edge of the mug, seeking to confirm that I really am sitting here on the couch at this unprecedented hour. Coffee fed intravenously would probably be more effective at this point. I reassure the steam from my coffee that it really is me sitting here, but only because I’m in an experiment to see how well creativity flows at such an early hour. I’m a six o’clock and not a minute before girl. Still, I’m up for a challenge and the challenge has been given. Actually, the challenge was to wake up two hours earlier and write, but waking up at four would leave me in an undesirable state to be around for a good part of the day. Not a good idea. Compromise was inevitable. I know creativity can flow in the evening, and considered being a non-conformist, staying up later rather than waking up earlier. That’s worked for me in the past. I wrote an entire novel in the late evening when our children were small. Granted, when they were small they went to bed early, my hubby went to bed early, and I had a quiet house all to myself—minus the distractions of the day. Fast forward many years. My children are no longer small. These young adult men that now tower over me don’t go to bed early. Quiet, distraction-free evenings no longer exist. Going to bed around eleven means I’m the first one to bed. Mornings may be the answer. Mornings fall into the distraction-free time zone. Yet the question remains: Can I get creativity to flow before six in the morning? I’m willing to try. Willing to experiment. My compromise is that I’m waking one hour earlier to see if this is even profitable for me. I’ve survived several days of the experiment, but survived is the operative word. I figure to prove or disprove it, I should give it a few weeks, so I’ll stick it out for a while longer before giving an opinion. I’ll check in at a later date and let you know if early morning works for me—or if I’ve decided to be a nonconformist and work out a different approach! How about you? When do you write? And why? What works for you? Let me know in the comment section!